Social networks online with a business orientation diminished with the astronomic growth of consumer-driven platforms like Facebook and Twitter. These served to cultivate broad acceptance of the principles of social networking in business, making it more popular among business professionals. Than along came LinkedIn with a more professional networking model that has amassed a worldwide membership of 332 million. LinkedIn is of course the biggest network for business in history. Not only is it the most successful business-oriented platform, LinkedIn acts as an umbrella to more than two million groups and subgroups for a vast array of business needs. While LinkedIn effectively serves a horizontal market of business people in all sectors, and to a certain extent accommodates the needs of vertical markets, the acknowledged lack of commercial benefits to professionals is spurring a new generation of business communities extraneous to the LinkedIn sphere.. The emerging communities are referred to as ‘Vertical Social Networks’, ‘Vertical Professional Networks’, or simply described as Vertical Networks’. These are now attracting increasing numbers of investment and interest. However, most are still grappling with models of generating revenue and few have reportedly reached profitability. Speculation is abuzz that major corporate players in technology, finance and media are vetting some Vertical Networks as future acquisition targets. And, among the most likely gobblers of Vertical Networks is none other than LinkedIn itself. HR As Strategic Business Partner? In many respects, the answer is obvious and simple. It should take primary responsibility for providing input, advice, direction, and execution with respect to organization effectiveness. Increasingly, what makes organizations effective is how they organize staff and manage their human capital. Modern organizations are dependent on complex systems and the knowledge of their employees. Yes, it's important for organizations to have the right amount of financial capital and hard assets, but it is the soft assets that are progressively the difference makers between successful and unsuccessful firms. Historically, many critics of the HR function (formerly known as personnel) have pointed out that HR is more of an administrative unit than a strategic player. Recently, more and more articles and books have claimed that HR has changed and become much more of a player when it comes to organizational effectiveness and business strategy. We present data from 1995 to 2010, which shows little to no change in how HR spends its time. It also shows that HR spends less than 15% of its time as a strategic business partner. Where does it spend most of its time? It spends it dealing with the implementation and administration of HR policies and practices. This is true in 1995, and data recently collected show that it is true in 2013. When HR executives were asked in the survey to report if they have recently increased the amount of time they spend on being a strategic business partner, their answer is, "Yes." Many report that it has increased significantly since 1995, despite the fact that our data say it has not. What should HR do and what can it do in order to become a more strategic business partner and greater contributor to organizational effectiveness. Before answering this question, it is important to note that the research clearly shows that spending more time as a strategic business partner leads to better company performance. It is clearly the right place for organizations to position their HR function. There are many ways that HR can contribute to business strategy. It ranges from helping to identify and design strategic options, through to picking the best options, including facilitating the implementation of the strategic options the company chooses to pursue. Usually new strategies require different behavior and different performance from many individuals and parts of the organization. This type of change should be a real sweet spot for HR. Unfortunately, our data suggest that HR rarely plays a major role in the development and implementation of business strategies. They are most active in helping design the organization for change, and least active when it comes to working with the corporate board. When I look at whether their role has changed in the recent years, the answer is, "No." HR seems to be about as involved in business strategy today as it was a decade ago. This is despite the fact that data clearly show that when it is involved, organizations function better and are much more successful in implementing strategic change. Incidentally, our data covers the U.S., Canada, Australia, India, Europe, China, and the U.K. We get virtually identical results from large corporations in all of those countries. The failure of HR to be the player it should be, with respect to business strategy, raises the question of how it can become more of a player in corporate strategy design, implementation, and change. Clearly, HR should be eager and ready to take on assignments having to do with organization design and effectiveness, but that may not be the best route to being a major player in business strategy. The best route may be through a focus on talent and its procurement, development, retention, and motivation. It's not a matter of just being a provider of good talent; it is a matter of identifying the critical talent that makes a difference between the organization being effective and not so effective. If HR can identify key talent areas and provide coherent, well-developed plans for obtaining, developing, and managing critical talent, it has opened the door to being a major strategic player, with respect to organizational effectiveness. Talent is clearly an area where CEOs and senior executives need help, recognize they need help, and often look to HR for advice and counsel. HR can establish its credibility by performing well in this area, and this can open the door to being a true strategic partner. Talent is a key issue among senior management and at the board level, so expertise in talent has the potential to make HR executives major players not just at the mid-level in organizations, but also at the board and senior executive levels. A major advantage of establishing credibility in the talent area is that it naturally leads to discussions about organizational design, rewards systems, strategy and change management. All of these additional areas need to be dealt with in order to create an effective organization, and should be natural parts of any discussion about talent development, procurement and identifying the critical positions in an organization. Talent can be the way to open the door to a broader role for HR that includes organizational effectiveness. Indeed, it may be the key to changing the very name of the HR function so that it becomes the organizational effectiveness function, but that is a topic for a future piece. It is clear that most organizations are not prepared to create an organizational effectiveness function at the senior corporate level that includes talent, organization design, change management, and information technology. But they ought to be, and in most cases, are ready to be helped in talent management by the HR function, and they know that in order to do talent management well, a broad assessment of the organization's work, jobs, rewards, etc., is necessary and needs to fit the organization's business strategy. Quote for the Week: "According to your latest social security income projections, if you retire today, you can live reasonably well until 5 p.m. tomorrow." The 2013/2014 Global Benefit Attitudes Study examines how employees' preferences for retirement security affect their financial priorities and retirement planning, what makes them join an organization and what makes them stay, and the kind of benefits they desire. The research was conducted in 12 countries, and the survey was completed by 22,347 employees representing all job levels and major industry sectors. For large numbers of employees around the world, retirement security has become a higher priority. Employees in India, Brazil, Caazil, Canada and the U.S. lead the world in concern about retirement security, while it is less of a priority in Japan. Retirement security has become a more important issue for me over the last two or three years (those choosing “agree” or “strongly agree"). In all countries, employees prefer more generous retirement benefits over higher pay when the benefits are guaranteed. Employees in Mexico, Chile, India, China and Australia lead all others. If your employer offered the choice between the following, which would you choose? 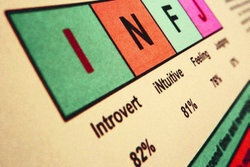 The Myers-Briggs Type Indicator is probably the most widely used personality test in the world. An estimated 2million people take it annually, at the behest of corporate HR departments, colleges, and even government agencies. The company that makes and markets the test makes somewhere around $20 million each year. "There's just no evidence behind it," says Adam Grant, an organizational psychologist at the University of Pennsylvania. "The characteristics measured by the test have almost no predictive power on how happy you'll be in a situation, how you'll perform at your job, or how happy you'll be in your marriage." But the test was developed in the 1940s based off the untested theories of an outdated analytical psychologist named Carl Jung, and is now thoroughly disregarded by the psychology community. Even Jung warned that his personality "types" were just rough tendencies he'd observed, rather than strict classifications. Several analysis have shown the test is totally ineffective at predicting people's success in various jobs, and that about half of the people who take it twice get different results each time. Yet you've probably heard people telling you that they're an ENFJ (extraverted intuitive feeling judging), an INTP (introverted intuitive thinking perceiving), or another one of the 16 types drawn from his work, and you may have even been given this test in a professional setting. Here's an explanation of why these labels are so meaningless — and why no organization in the 21st century should rely on the test for anything. In 1921, Jung published the book Psychological Types. In it, he put forth a few different interesting, unsupported theories on how the human brain operates. Among other things, he explained that humans fall roughly into two main types: perceivers and judgers. The former group could be further split into people who prefer sensing and others who prefer intuiting, while the latter could be split into thinkers and feelers, making for a total of four types of people. All four types, additionally, could be divided based on attitudes, into introverts and extraverts (Jung's spelling). These categories, though, were approximate: "Every individual is an exception to the rule," Jung wrote. Even these rough categories, though, didn't come out of controlled experiments or data. "This was before psychology was an empirical science," says Grant, the Penn psychologist. "Jung literally made these up based on his own experiences." But Jung's influence on the early field was enormous, and this idea of "types" in particular caught on. Jung's principles were later adapted into a test by Katherine Briggs and her daughter Isabel Briggs Myers, a pair of Americans who had no formal training in psychology. To learn the techniques of test-making and statistical analysis, Briggs worked with Edward Hay, an HR manager for a Philadelphia bank. They began testing their "Type Indicator" in 1942. It copied Jung's types, but slightly altered the terminology, and modified it so that a person was assigned one possibility or the other in all four categories, based on their answers to a series of two-choice questions. Raise two (the number of possibilities in each category) to the fourth power (the number of categories) and you get 16: the different types of people there apparently are in the world. Myers and Briggs gave titles to each of these types, like the Executive, the Caregiver, the Scientist, and the Idealist. With most traits, humans fall on different points along a spectrum. If you ask people whether they prefer to think or feel, or whether they prefer to judge or perceive, the majority will tell you a little of both. Jung himself admitted as much, noting that the binaries were useful ways of thinking about people, but writing that "there is no such thing as a pure extravert or a pure introvert. Such a man would be in the lunatic asylum." But the test is built entirely around the basis that people are all one or the other. It arrives at the conclusion by giving people questions such as, "You tend to sympathize with other people" and offering them only two blunt answers: "yes" or "no." If private companies want to throw their money away on the Myers-Briggs, that's their prerogative. But about 200 Federal agencies reportedly waste money on the test too, including the State Department and the CIA. The military in particular relies heavily on the Myers-Briggs, and the EPA has given it to about a quarter of its 17,000 employees.